For those of you who haven't heard of them, the Westboro Baptist Church(WBC) consists mainly of Fred Phelp's(the churches minister) descendants. The Church gained notoriety in the early 90's when they began to picket the funerals of AIDS victims with signs that said, "GOD HATES FAGS" and, "THANK GAD FOR AIDS". Since then it seems the Church is always looking for new ways to warn folks, outside their own family, that we are all hated by God and definitely going to hell. In the last few years they have picketed other Churches, the funerals of fallen Iraq/Afghanistan soldiers, and Jewish cultural events. Their main theme appears to be that America's acceptance of homosexuality is the root of all the evils in the world. In countless interview members of the Phelps family admit that they believe that members of the Westboro Baptist Church are the only ones in the world going to heaven, everyone else goes to hell. Late last week AFSC became aware that the WBC was coming to Atlanta to picket various locations over the course of two days. We may have decided to simply ignore the news except for one troubling new development we noticed. This time they were picketing High Schools. Everyone in the office agreed that we had to at least warn schools and look into ways to support student organizers that were perhaps already preparing for the WBC picket. 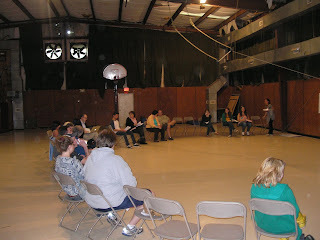 We decided to hold a city wide meeting for youth and youth allies to explore the city wide reaction to the WBC pickets. The meeting was to be held at the Horizon School gym. 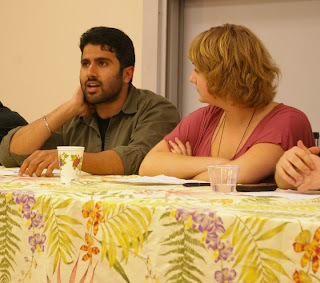 Faculty at the school requested that AFSC come the morning before the city wide meeting and talk with their high school class about effective was to confront hate and intolerance in their community. We decided to show the school the short BBC documentary, "The Most Hated Family in America" which chronicled the Phelps familiy and other WBC members. After the film we processed students feelings about the film and facilitated a thirty minute discussion about how to affectively confront hate without giving into it yourself. That evening we greeted over 50 participants from all over the city that had come to discuss their feeling about the WBC's visit and create a strategy to counter their presence. The overwhelming sentiment in the room was that folks wanted to find ways to spin the WBC's hateful message into something that could be positive. How could we use the WBC's visit to raise money for the very groups that they hate? How can we use their visit to cultivate new progressive youth groups that would continue to be active long after the WBC left? 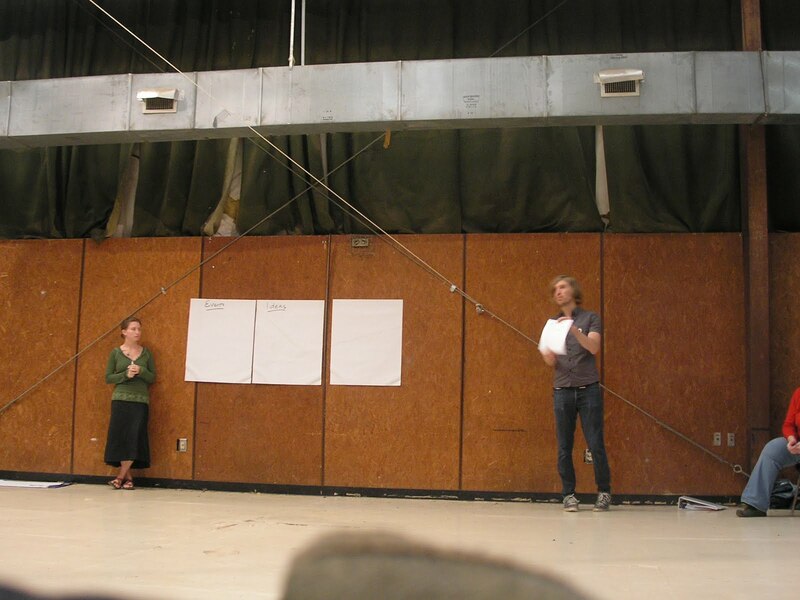 These questions and more we explored during the meeting. 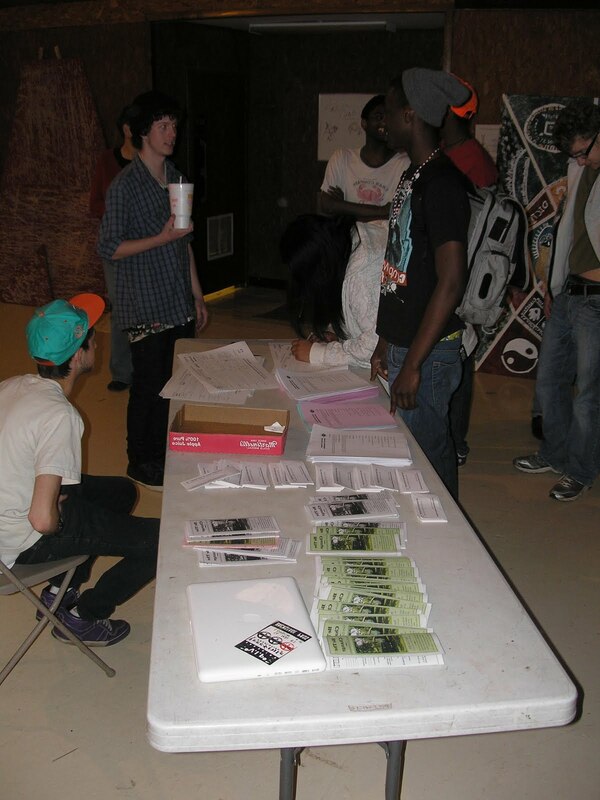 Everyone was especially impressed with the student lead organizing work that had gone into the Grady high school counter demonstration. 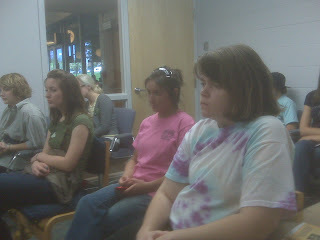 Several Gardy students stood up and gave a report on how they planned to respond to the WBC picketing their school. They basically decided to have a big love fest on the other side of their campus while the WBC held their signs for no one to see. Grady students decided to use the opportunity to launch a new student lead organization call, "Acceptance, Tolerance, Love", or "ATL". At their event, which will take place May 6th from 3:15-4:15 they will be raising money for AID Atlanta and the Rainbow house. Free hugs will be given and, along with good vibes. So as a group we decided to hold similar expressions of love and tolerance in front of other high schools, and venues that the WBC plans to target next week. Students at the Horizon School plan to be a part of our caravan. The final finale for the to day WBC caravan will be at Grady. We invite you all to join us! Agent Orange Justice Tour Makes a Stop in Atlanta! 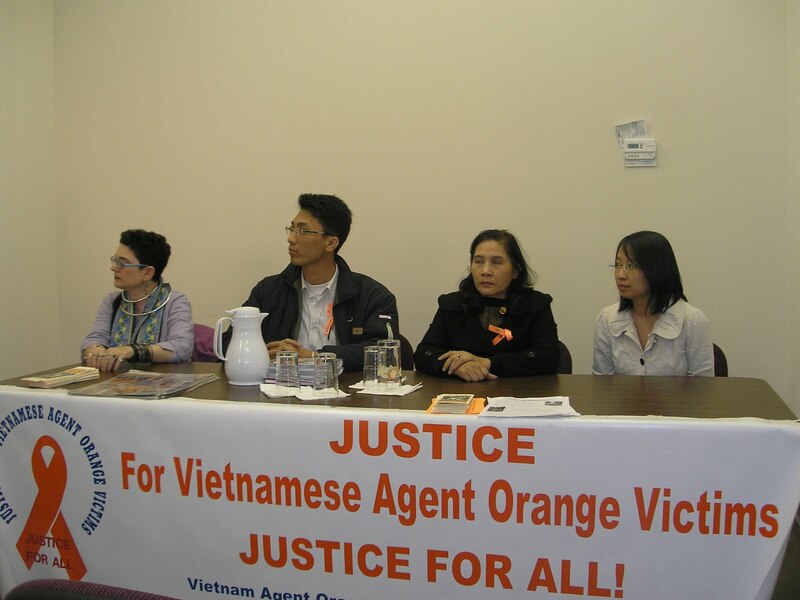 On April 27th, AFSC hosted a delegation touring the US for the 5th Agent Orange Justice Tour. 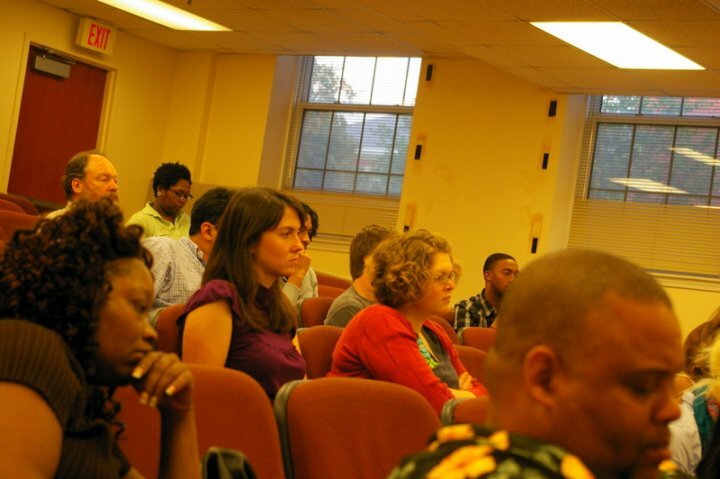 The event was sponsored by the National Lawyers Guild International Committee, National Lawyers Guild-Georgia Chapter, GPJC, International Action Center, AFSC, and Georgia Veterans for Peace. About 15 people were in attendance, including representatives of the various sponsor groups and concerned community members. Merle Ratner began by outlining some of the work of the Vietnam Agent Orange Relief and Responsibility Campaign. She shared the basics of Agent Orange, a chemical used as a defoliant in Vietnam to clear the land of hiding places and food. Because the chemical was made quickly and in mass quantities, companies carelessly allowed the levels of dioxin to reach catastrophic levels, wreaking havoc on both the Vietnamese people and American soldiers. 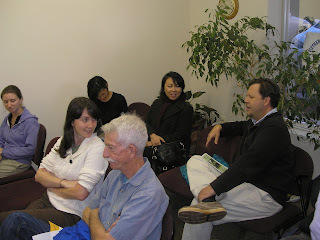 Ms. Ratner then introduced the delegation, Pham The Minh and Nguyen Thi Hien. Mr. Minh spoke first and moved the audience with his personal story of being affected by Agent Orange. As the son of Agent Orange victims, he and all of his family members have suffered physical illness and injury due to the poison. However, he is overcoming these difficulties by moving forward and working as an advocate for victims internationally. 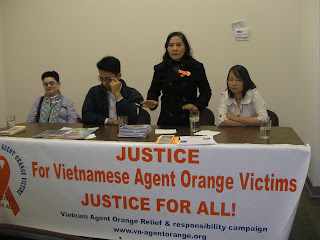 Next, Ms. Hien spoke through a translator about her experience with Agent Orange and her work with the Vietnam Association for Victims of Agent Orange (VAVA) helping victims of the war. 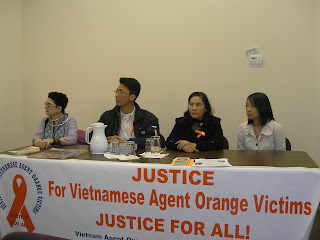 Ms. Hien emphasized the fact that justice needs to be found for ALL victims of the war and highlighted the three groups the campaign is aiming to help: victims and their descendants in Vietnam, international veterans and their descendants, and the Vietnamese-American community. 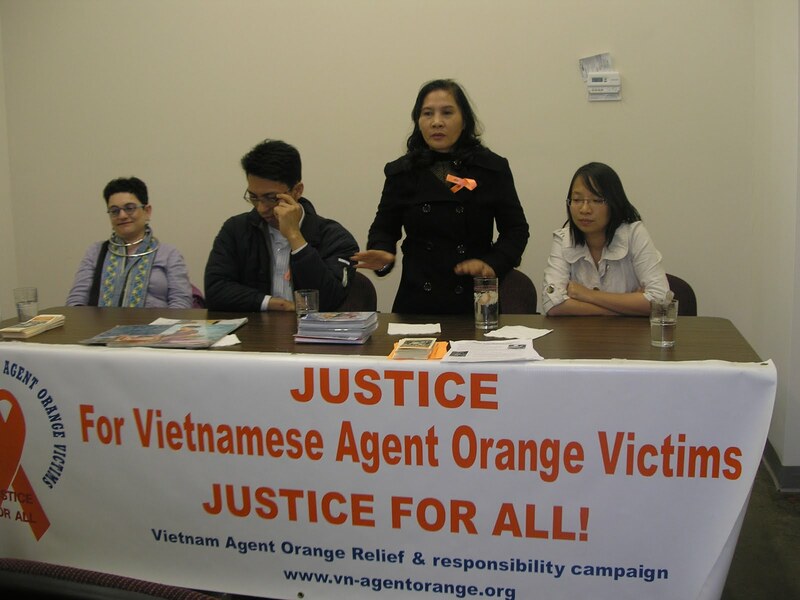 Ms. Hien's work with VAVA has helped establish innovative rehabilitational programs for victims, and she hopes to extend that work and continue to fight for justice for those affected by Agent Orange around the world. Finally, John Zientowski with Veterans for Peace spoke briefly about the effect of Agent Orange on veterans and their families. He agreed with the delegation that both the government and the chemical companies should be held responsible and made to compensate victims. The chemical companies were aware of the effects of the poison on both people and the environment. 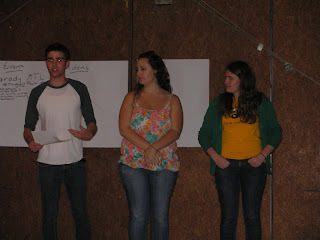 John emphasized that the story needs to be told again and again until the suffering of victims is alleviated, and the response from the audience once the floor was opened for questions made it clear that everyone planned to help spread the word through Internet posts, raising awareness, and fundraising. 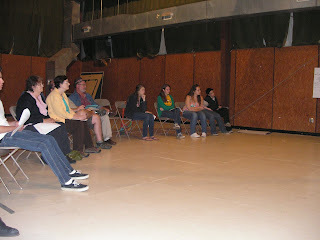 The audience was clearly moved by the testimonies. I was particularly struck by how much racism and classism influenced the war, and how much the use of Agent Orange revealed a complete disconnect from the land. It was telling to hear how reluctant anyone is to deal with or take blame for the aftermath. War is already so costly in so many ways. Imagine how much more costly it would be if warring nations actually kept their promises to deal with the consequences of war. It is this true price the Agent Orange Justice Tour is trying to bring to light, the forgotten victims around the world. To find out more about either the corporate campaign to get compensation from the chemical companies or the bill soon to be going through Congress, please visit http://vn-agentorange.org/index.html. Special thank you to the delegation who made a lot of sacrifices to be here traveling and to the sponsors who made this event possible. Please spread the word about the Agent Orange Justice Tour to your friends in other host cities! 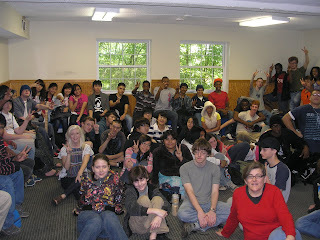 AFSC Atlanta had the opportunity to work with the Movement to End Israeli Apartheid Georgia(MEIAG) in their effort to organize the Atlanta concert for the DAM 2010 Spring tour. For those the don't know DAM is the first hip hop crew to come out of Palestine and their the subject of the award winning and wildly entertaining documentary, "SlingsShot Hip Hop." It took us over six months to get DAM booked for the show. 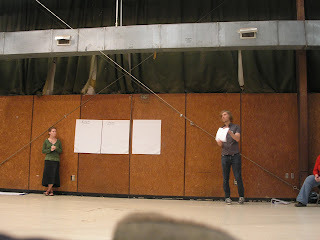 We did have DAM booked tentatively last November but the US denied their visas and we had to do the show without them. There was fear up to the last few weeks that the same thing could happen again. We knew that show was going to be big when the facebook event grew from 350 invites to 5000 in a matter of days. MEIAG folks also plastered Atlanta with beautiful concert posters, made radio PSA's, and booked to popular Atlanta hip hop acts( Contraverse and Weapons of Audio) to promote the show. The show was booked at the Drunken Unicorn, a venue known for it's great sound system and kinetic crowds. Any anxiety about a light turnout totally evaporated when the doors opened at 9pm to a rather long line of folks anxious to get in. The venue reached max capacity within 45 minutes!! After members of MEIAG welcomed the crowd Weapons of Audio launched into an energetic set that infused electronic funk and hip hop. Contraverse also wowed the crowd with their sharp beats, tight rhymes, and smooth flow. It's safe to say that the crowd was thoroughly warmed up for the eagerly awaited headlining act, DAM. I've been a hip hop fan for years. I grew up on Def Jam artist of the 80's. The first album I every bought was Run DMC's "Raising Hell". I must say the DAM is an unusual occurrence in a live hip hop experience. They definitely bring an energy that could match any hip hop act touring today, they have a lot of charisma live( you really can never tell by watching a groups videos), their beats force your hands in the air, their lyrical message holds depth and meaning with out coming off preachy or compromising the shear entertainment of the show. DAM's performance was one of the stronger hip hop shows I've seen in years. The crowd might have torn the walls down had DAM not played an encore. After DAM leaving the stage there was literally a layer of moisture on the ceiling dripping down, no joke. Folks stuck around after the show to network, meet the bands, pick up MEIAG literature and sign up on MEIAG's email list. The show was a great opportunity for MEIAG to get face to face with folks in the community that normally would not come out to panels, research meetings, or demonstrations. It gave us a chance to talk about an Atlanta based Boycott, Divest, Sanctions campaign designed to cut cultural and financial ties with Israel, and engage new partners in the community. 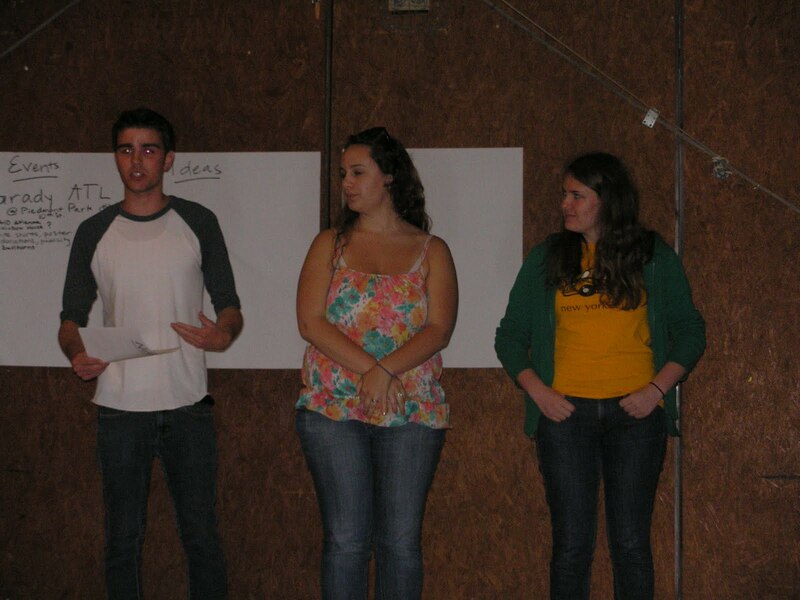 The night was a huge success for MEIAG and AFSC was excited to have a part in it. Schooling the System with Spirit! In celebration of the 50th anniversary of the Atlanta Student movement, six amazing students from the Atlanta community came forth and spoke out on what inspires, challenges, and changes they would like to see. Many people came out to show their support and join in on the discussion of hope for the Atlanta student community. Our very own Caitlin Barrow spoke about her inspiration through Georgia Peace and Justice Coalition's " Eyes Wide Open" event where they display combat boots in honor of the soldiers fallen in the war overseas. 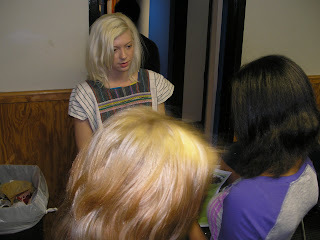 She was so touched by this event she became very involved in her own hometown until she moved to Atlanta. 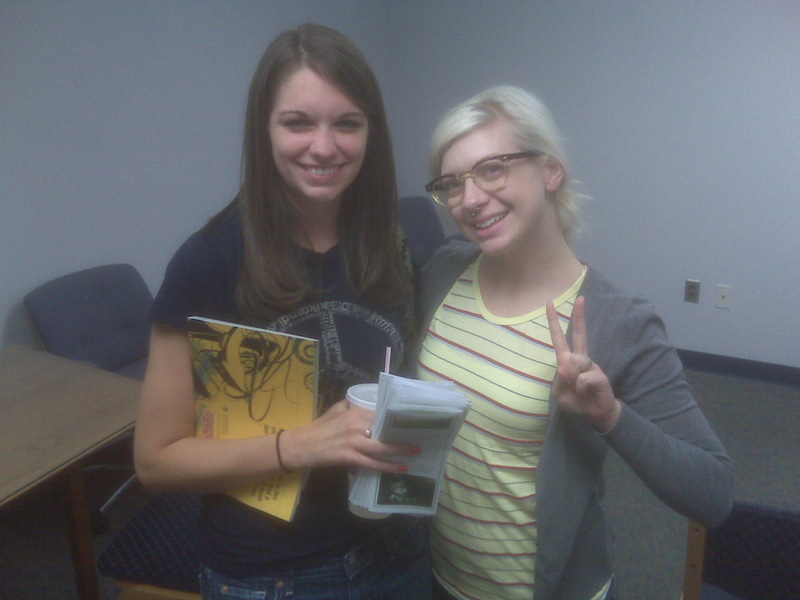 Now that she is in Atlanta,she is a founder and leader in the Georgia Progressive Student Alliance, is very involved with SCAP, and is on staff with the American Friends Service Committee. Another Student from Agnes Scott really touched me. She identified with what she called a "Queer Blacksican". Her mother being an immigrant from Mexico and her father being a black man. She raises awareness of the link between all different types of oppression and how we shouldn't "compete" on who has it worse, but come together, make our numbers stronger, and fight what oppresses us together. I was really inspired by her words. She really stood for "divided we fall, together we stand" and the saying rings true. 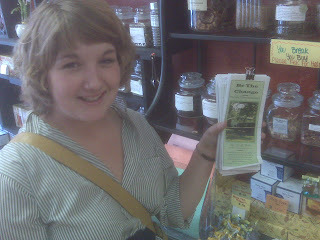 She also recognized the importance it is to reach out to the people who do not share the same views with us. Representing your cause in an intelligent patient way can get across much better than defensive banter. And you may be surprised on whos views you may change and knowledge you can spread. 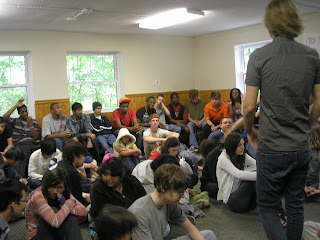 The students brought a fresh new hope that was spread into every person in the room. And I want to thank each college that was represented : Morehouse College,Georgia State University,Agnes Scott College, Spelman College, Emory University, Georgia Tech. It was such a delight to hear from these inspiring people and I cannot wait to see their passions and actions lead to change in Atlanta. Many remember our battle with the the Georgia Senate Defense and Veteran's Affairs Committee over our Resolution that addressed the unethical, often illegal military recruitment of children in the Georgia school system. That battle climaxed with a pretty contentious hearing that featured testimony from students, teachers, parents, former military recruiters, combat veterans, even the officer in charge of National Guard recruitment showed up. The end result of that hearing was rather interesting. As a result of all the statewide support our campaign built, not one Senator would second a motion to kill the resolution. In fact several Republican Senators found parts of the resolution that they agreed with and one of our opponents on the committee said he was in favor of a standardized statewide opt out system. 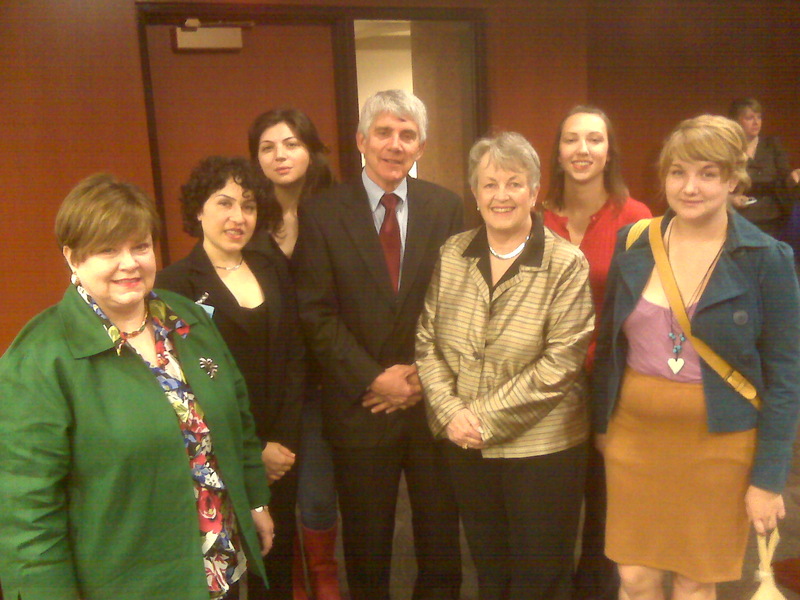 After much discussion with Azadeh Shahshahani, Senator Orrock, and Stephanie Stuckey Bennfield it became clear that the thing to do was to keep the momentum up, stay on the offensive on the issue. Senator Orrock re-worded the resolution, focusing solely on the privacy issue, advocating for a statewide standardized opt out system, and we wanted to get it assigned to the more reasonable education committee where it belonged in the first place. A few weeks ago the Bill was introduced in the House and Senate by Senator Orrock and Representative Bennfield. Well yesterday at 4pm I was informed that the Education Committee was going to have a hearing on the Bill at 8:30am! My initial thought was, We're not gonna be able to get anyone there....but we got to try anyway. Caitlin Barrow and I immediately started working the phone and putting out appeals for folks to call members of the Senate Education Committee in support of SB 528 and to try to come to the hearing in the morning. "My son attended a high school in Henry County and my daughter will attend one there in a few years. We are a private family. Our telephone number is unlisted. We do not appreciate receiving unsolicited mail. We do not distribute our email address to anyone other than those from whom we wish to hear. Basically, our family values the space that privacy provides. We do not like a situation of having no alternative but being subjected to unsolicited promotions of things that are not important to us and that includes military recruitment. We can turn off the television and we can put your phone number on a “do not call” list, so why should it be made hard to say no to military recruiters? Unsolicited military recruitment materials started arriving in our home. I discovered that my address and telephone number had been released to them by Henry County Schools. The school system did not send a notice home like it routinely does for every single field trip or when teaching controversial matters. It did not have a point of contact for parents to learn more. The school system did not have an opt-out form. I would eventually have to learn myself and subsequently put my request in writing and send it to the Superintendent. I did, and the solicitation eventually stopped, but the problem continues for others." When I showed up in room 310 of the Coverdale Legislative Office Building there was already several folks who had come out to support the Bill or testify in favor of the Bill. Among those who had come to lend their vocal support was none other then Sally Sullivan, who represents the PTA of Georgia. All in all thirteen people came to the hearing as a result of our last minute ask. Not bad for that kinda notice on a raining Tuesday morning! 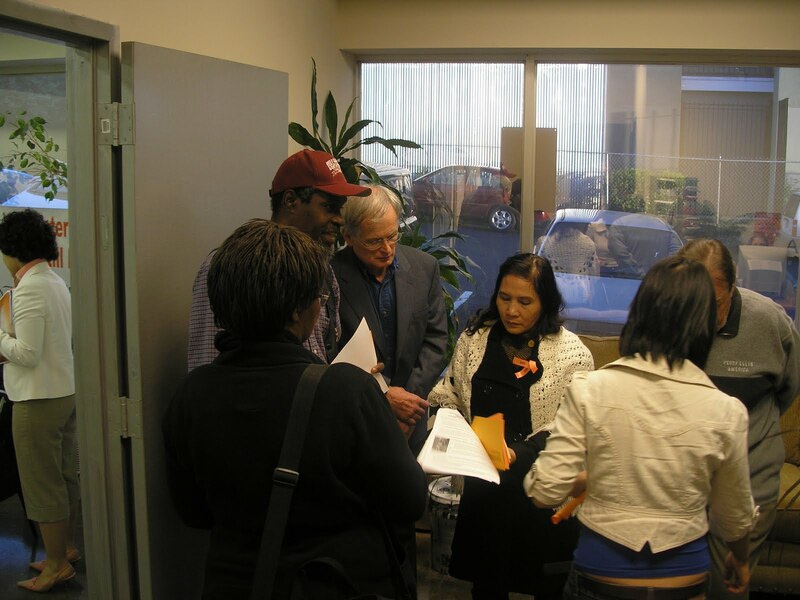 I noticed while I was signing up our folks to testify that the overwhelming number of folks that had sign-up to testify in regards to a purposed Bill were there to speak in favor of SB 528. When the hearing began Senator Weber, the Committee chair, said that the hearing would be cut short and they would likely not hear from most people in the room. This was very bad news, as SB 528 was the last of several Bills on the agenda. As we suspected the meeting adjourned before SB 528 was discussed. After the session adjourned I confronted Senator Weber and he was very apologetic claiming that most of the Committee members had to make other Committee meetings. of course I questioned why the hearing was scheduled in the first place if all the agenda items weren't going to get he attention they deserved. So with our crew present I asked him to commit to us to accept the Bill into the Education Committee next legislative session and to give us a fair hearing, devoted solely to this issue, with plenty of notice. He agreed. Here at AFSC we believe that the consequence of joining any branch of the military are just to great to allow little known recruitment policies that target minors and low income folk to prevail. Parents should play an important roll in this discourse, especially when the end result of the recruitment process could put these teenagers on a battlefield. A standardized statewide military recruitment opt out system in our school system should have been implemented years ago. Azadeh Shahshahani of the ACLU Georgia stated, "As it stands, many parents and students in Georgia are not being adequately notified of their right to make a request that students' contact information not be released to military recruiters without prior parental consent. As such, Georgia schools might be in violation of some provisions of the Family Educational Rights and Privacy Act and the No Child Left Behind Act. We hope that by passage of this legislation next year, the Georgia legislature would address thus problem and ensure that all schools in Georgia have an adequate notification process in place." mark, "Legislative Action" in the subject line. 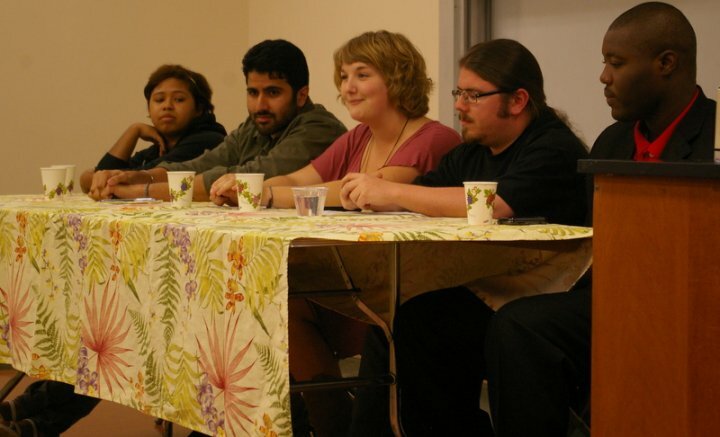 Members of the Dalton State University Peace and Justice group asked American Friends Service Committee to put together an event that would educate students and faculty about the realities of military service and the recruitment process. For those that don’t know DSU is not only a major target for military recruiters, the school has many Iraq/Afghanistan veterans enrolled in classes. 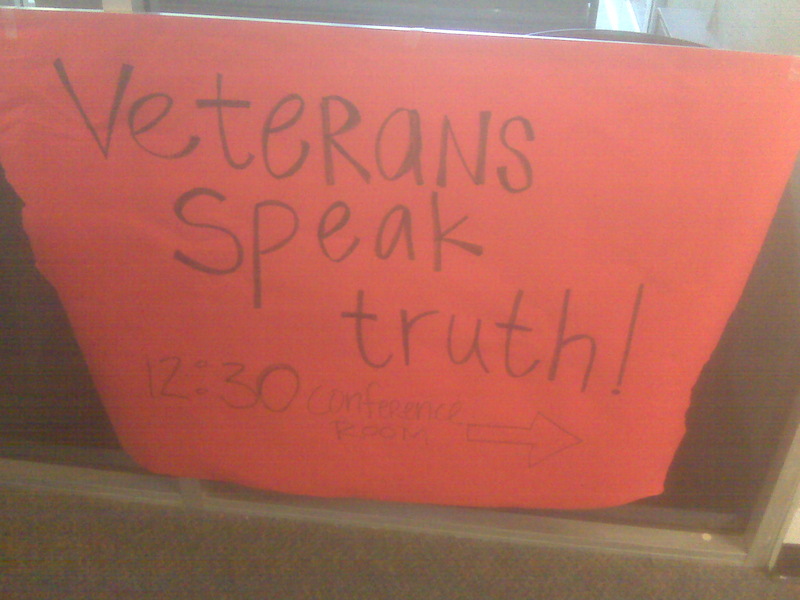 So we organized an event entitled, “Veterans Speak Truth”. We were honored to be able to have Iraq War veteran and form Marine Corps recruiter Chris Raissi and Vietnam combat medic John Zientowski come speak at the event. 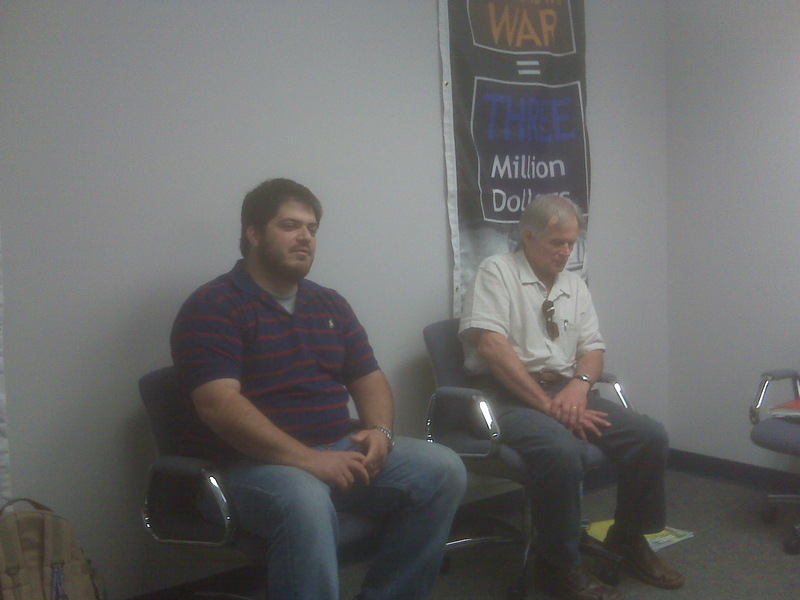 Chris and John both shared their experience in the service and expressed feeling like they had joined the military to protect their country and ended up feeling betrayed by the military industrial complex. John stated, “we were sent over there(Vietnam) to kill working people with families just like us”. Chris stated, “I joined after 9-11, I was gung-ho. It didn’t take long for me to realize that this war(Iraq) had nothing to do with freedom or 9-11. I felt totally used”. After we left the college we took the opportunity to flyer downtown Dalton with, "Be the Change" Youth Convergence brochures. Connecting the Dots in Augusta Ga. 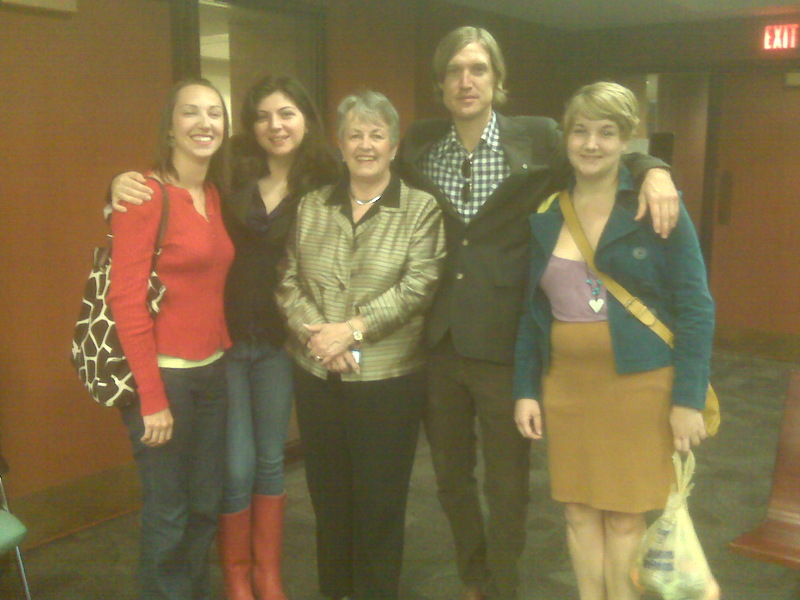 This past weekend the Central Savannah River Area Peace Alliance hosted the Georgia Peace and Justice Coalition and the American Friends Service Committee down in Augusta, Ga. for an event called “Connecting the Dots.” Art as an Agent for Change, an amazing spoken word group from Milledgeville, Ga., inspired the community with poems that linked militarism, racism, and materialism. These connections were made my Martin Luther King Jr. in his 1967 “Beyond Vietnam” speech and serve as the grounding text for the upcoming “Be the Change” youth convergence in May. After the event pizza and cookies were to be had by all and everyone gathered to socialize at the community center. Gwen Johnson and Maxine Donaldson are two women from Big Sisters in Action, a local non-profit that mentors young women. 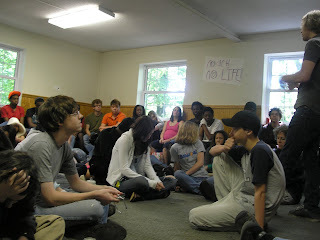 They connected with AFSC at Poor Peoples Day in Atlanta and invited us to come out and have an event in Augusta. This event could not have happened without their support and the support of other members on the board of the community center. Everyone was so grateful to have something like this take place in their community and made us promise we would return for future events.